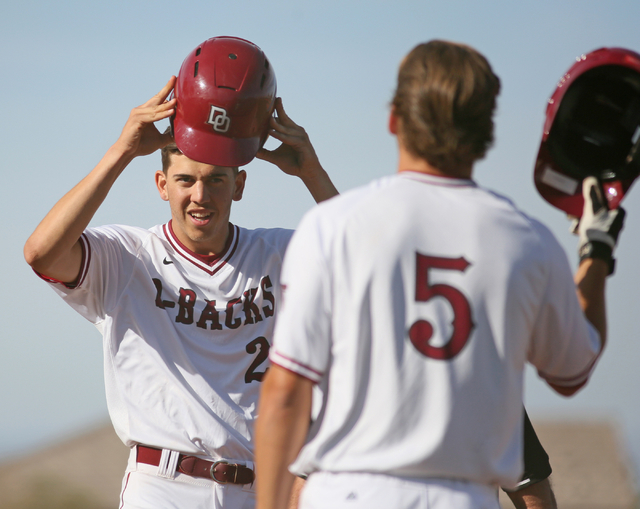 Each member of Desert Oasis’ baseball team has a walk-up song that plays before his at-bats during home games. It’s an eclectic mix, ranging from classic rock to 50 Cent to Poison Ivory. Nolan Kingham’s tune is different, though. It is an original rap recorded by teammate Bryson Stott’s brother. 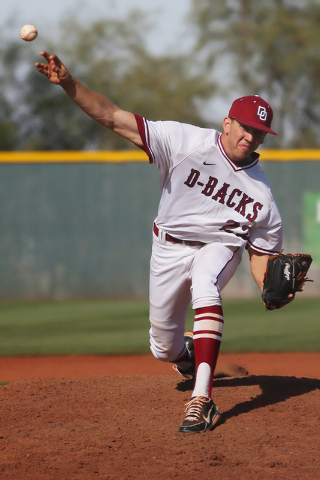 Kingham, a 6-foot-4-inch, 200-pound senior, is a two-way standout for the Diamondbacks and one of the top pitching prospects in the West region. 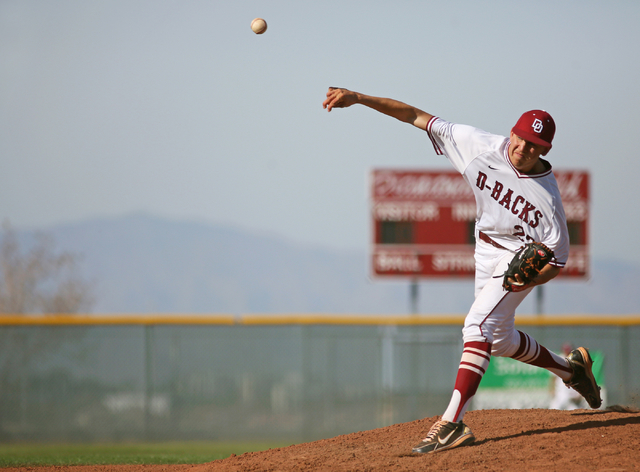 Armed with a fastball that has been clocked as high as 96 mph, the lanky right-hander is expected to be the first Desert Oasis player selected in Major League Baseball’s first-year player draft in June. Kingham spent his first three years at Sierra Vista and was a second-team All-Sunset Region selection as a junior after going 5-1 with a 3.53 ERA. But when Sierra Vista moved to Division I-A and veteran Mountain Lions coach Nate Selby retired after the 2013-14 school year, Kingham decided to transfer to Desert Oasis for his senior year through the Clark County School District’s open-enrollment policy. Kingham is 2-1 with a 3.32 ERA and has struck out 18 batters in 19 innings this season. He also is hitting a team-best .400 with one home run and 11 RBIs for the Diamondbacks (9-5, 1-1 Northwest League). 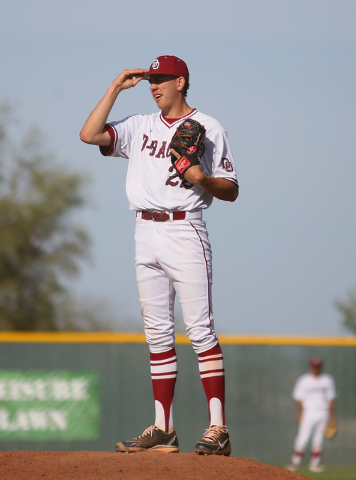 Kingham picked up a no decision in Monday’s 5-3 eight-inning loss to Cimarron-Memorial. 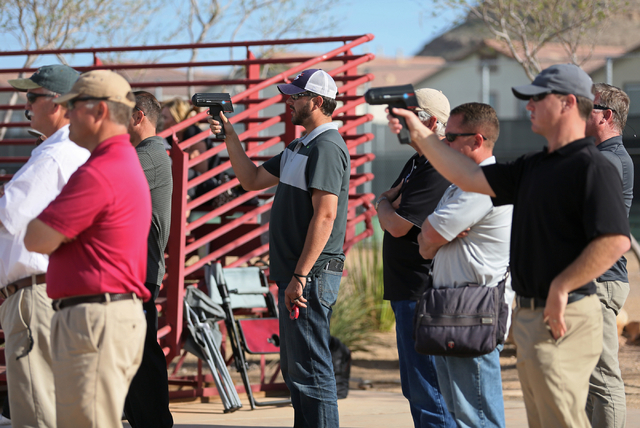 With more than a dozen professional scouts stationed behind home plate, Kingham allowed three earned runs and nine hits in six innings, and he hit 95 mph on the radar guns. Kingham spent more than two months on the road by himself last summer, traveling to the Perfect Game national showcase in Fort Myers, Fla., in June before heading to USA Baseball’s Tournament of Stars in Cary, N.C. He also won an 18-and-under national title with the Ohio Warhawks and competed in the prestigious Area Code Games. In November, Kingham signed a national letter of intent with Texas. His parents, Don and Roxane, are from the Houston area, and he said most of his family lives in Texas. Kingham was projected as a first-round pick at this time last year and currently is ranked No. 134 among prep prospects by Perfect Game, though he is expected to rise when the new rankings are released next month. In addition to his dominant fastball, scouts are attracted to Kingham’s bloodlines. His older brother, Nick, was a fourth-round pick in 2010 out of Sierra Vista and is one of the Pittsburgh Pirates’ top pitching prospects.